1. Still; being in a state of rest; now moving. Judg 16. 2. Still; free from alarm or disturbance; unmolested; as a quiet life. 3. Peaceable; not turbulent; not giving offense; not exciting controversy, disorder or trouble; mild; meek; contented. The ornament of a meek and quiet spirit. 1 Pet 3., 1 Th 4. 6. Undisturbed; unmolested; as the quiet possession or enjoyment of an estate. 7. Not crying; not restless; as a quiet child. 1. Rest; repose; stillness; the state of a thing not in motion. 2. Tranquility; freedom from disturbance or alarm; civil or political repose. Our country enjoys quiet. 3. Peace; security. Judg 18. 1. To stop motion; to still; to reduce to a state of rest; as, to quiet corporeal motion. 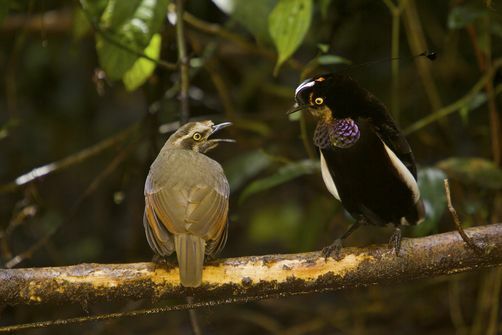 The Queen Carola’s Parotia (Parotia carolae) also known as Queen Carola’s six-wired bird-of-paradise is a species of bird-of-paradise. One of the most colorful Parotias, the Queen Carola’s Parotia inhabits the mid-mountain forests of central New Guinea. The diet consists mainly of fruits and arthropods. The stunning courtship dance of this species was described in detail by Scholes (2006). 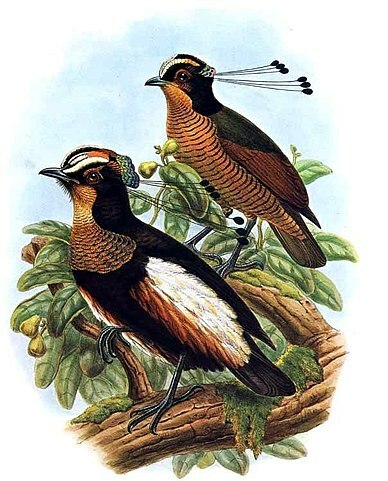 It is similar to that of Lawes’s Parotia, but modified to present the iridescent throat plumage and the flank tufts to best effect. The name commemorates Queen Carola of Vasa, the wife of King Albert I of Saxony. The king was honoured with the King of Saxony bird-of-paradise. This entry was posted in Avian and Attributes, Birds, Birds of the World, Birdwatching, Christian and tagged Attributes of God, Christianity, Creation, Nature, Peaceful, Photography, Proverbs 1, Quiet. Bookmark the permalink. Well, now I know where the rock singers get their inspiration for their wild carrying on when they are on stage in front of all those impressionable girls.